The fundamental principles of the United States were honored and extended by Frances Perkins, who was “The Woman Behind the New Deal: The Life and Legacy of Frances Perkins – Social Security, Unemployment Insurance, and the Minimum Wage” (ISBN: 9781400078561). A tireless worker for justice, Perkins has too long been hidden from history. Kirstin Downey seeks to remedy the oversight in her fascinating book. A great deal of what Americans take for granted today can be traced back to February of 1933, when a middle-aged woman named Fannie Coralie Perkins presented president-elect Franklin Delano Roosevelt with a list of her priorities if she was going to accept his offer to become the first woman member of a presidential cabinet. She ticked off the items: a forty-hour workweek, a minimum wage, worker’s compensation, unemployment compensation, a federal law banning child labor, direct federal aid for unemployment relief, Social Security, a revitalized public employment service, and health insurance. As author and historian Kirstin Downey writes, “The scope of her list was breathtaking.” Not only was Perkins’ plan a sweeping realization of the bright and shining America that was envisioned by our founding fathers, but it was so right, so just, and so fair that everyone knew it would face fierce denunciation and obstruction from greed-obsessed troglodyte conservatives in business and government. Of all the heroes in America’s past who have been overlooked by the history books, perhaps the most egregious is that of Perkins. Very few people have accomplished as much without having statues erected in their memory across the land. If not for Frances Perkins, our nation would be in far worse shape than the regressive forces want it to be. In Kristin Downey’s “The Woman Behind the New Deal,” the battle against the evil of conservatism is presented in fascinating chapters that are full of human touches as often as they are filled with facts. When Frances Perkins took over the Department of Labor, things were not just a mess, they were moribund — “the agency had gone nearly dead under Republican control during the 1920s.” As history shows, that’s almost always what happens to human values under Republican administrations. Perkins not only had to clean house, she also had to insist on desegregating the lunch facilities in the building. For much of FDR’s presidency, democracy was under attack by the Axis powers, just as democracy is continually under attack from conservatives. Today we see the odious techniques of Ted Cruz and Darrell Issa, which many think are based on the 1950s approach of the disgusting Joseph McCarthy. Actually, these have their genesis in some of the attacks on Perkins, a few examples of which appear in the book. America has always had to contend with enemies both foreign and domestic but Perkins had a special battle because of her gender. No matter what she did to deflect public attention, Frances’s unique place in American history guaranteed that the fifty-two-year-old Cabinet secretary was scrutinized wherever she went. Casual observers continued to comment on her appearance, her clothing, and her speech, often noting that she appeared far more attractive in person than she did in photographs. Her lack of conventional beauty remained a recurring theme in her life, another cross for a woman to bear that men do not face. Sad to see how little has changed. The accomplishments of FDR and Perkins’ Labor Department were enormous. Together, they helped bring the country back from the depths of the Republican Depression, placing more than 25 million Americans in jobs. The United States offered loan insurance through the Federal Housing Administration (FHA), which meant that private lenders could once again loan money for home purchase or remodeling with confidence that they would be repaid — if not by the borrower, then by the government. The program introduced a concept that would revolutionize home purchase: 20 percent down payment, fixed rate mortgages, payments lasting twenty years. The risky interest-only loans of the 1920s almost disappeared. thirty-four thousand projects, including the Grand Coulee Dam on the Columbia River, the All-American Canal in Southern California, the Triborough Bridge and the Lincoln Tunnel in New York City, the road linking the Florida Keys, the Blue Ridge Parkway from the Shenandoah to the Great Smoky Mountains, and scores of hospitals and public schools. It helped create the infrastructure that allowed the U.S. economy to expand dramatically in future years. There was one constant in all of this success: rabid and virulent Republican obstruction to any and all progress on behalf of the fundamental principles of America. Sad to see how little has changed. Thanks to Perkins, the Roosevelt administration brought to life fundamental human values by letting capitalism work with and control socialized principles. The result was a steady rise in the common good. As can now be seen in Congress and in statehouses across America, the battle for the common good is a conflict that continues today. 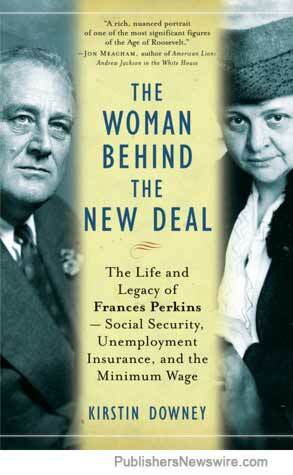 This book reiterates how we could all take heart from the ideals, tactics, and tenacity of Frances Perkins. Reading about her in “The Woman Behind the New Deal” is continually compelling and her successes will often have you shouting for joy.